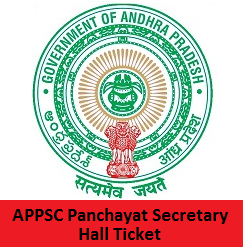 APPSC Panchayat Secretary Hall Ticket 2019: Good news for the candidates who are waiting for the APPSC Panchayat Secretary Admit Card 2019. The higher authorities of Andhra Pradesh Public Service Commission (APPSC) had announced the exam dates as Screening Test on 21st April 2019 and Mains Examination on 2nd August 2019. They have not yet mentioned the Admit Card release date. Most probably, the APPSC Group 3 Hall Ticket 2019 will be available from 15th April 2019. Information about APPSC Panchayat Secretary Admit Card 2019 is completely available on this page. The delegates of Andhra Pradesh Public Service Commission (APPSC) had not clearly mentioned the exact release date of the APPSC Panchayat Secretary Hall Ticket. And the APPSC Panchayat Secretary Admit Card 2019 can be downloaded only from the official site that is psc.ap.gov.in. So, the link will be activated after the hall ticket gets released. Candidates appearing for the Panchayat Secretary Examination should carry some important documents along with the APPSC Call Letter 2019. They can carry any one of the below mentioned documents. Competitors who had applied for APPSC Panchayat Secretary Recruitment 2019 and are eagerly waiting to download the APPSC Panchayat Secretary Admit Card 2019 can make use of this section. Here we clearly mentioned step by step procedure to download the APPSC Call Letter 2019. Initially, aspirants have to visit the official site of Andhra Pradesh Public Service Commission (APPSC). The official site is psc.ap.gov.in. There you will get the home page of APPSC on the screen. In that page search for the APPSC Panchayat Secretary Hall Ticket 2019. Immediately after identifying the link click on it. Crosscheck all the information you had provided is correct or not. You will get the psc.ap.gov.in Admit Card 2019 on the new page. Download the APPSC Call Letter 2019 and take two to three copies of that Hall Ticket for further process. All The Best to the aspirants who are going to attend the APPSC Panchayat Secretary Examination. For more information about this psc.ap.gov.in Admit Card 2019, you can visit our webportal freshersnow.com. If any doubts comment us in the below provided comment box.